These pix were taken by Holly's digital camera. The camera I was carrying was loaded with old, damaged 35mm film. It is one thing to attempt to use a roll of old film with your camera, if you know how to store it safely in a cool dry place, but somebody unloaded a bag of old film dating back to 2007, and carrying around a camera thinking you're going to get terrific pictures over digitized pixel exposures can be a real let down. about the only thing keeping me from losing my confidence in the whole lomography scene is the fact that no matter how many opptys I might have to capture something breathtaking, the chances that I'll be able to sneak myself into the picture is zero. I'm definitely not budding talent in this department, so I don't really mind sharing a picture with you that I neither took myself, or exposed on my camera. The only relevant thing about it is that I'm in it. The day of these pix were taken, the weather was gloomy. At least is was where the ride started off, but the clouds disipated the closer we got to the desert. Top photo is actually Victorville. 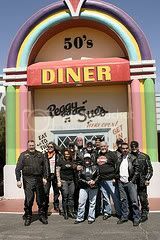 A lot a the riders, upon reaching Yermo, wanted to continue toward Vegas. Who wouldn't, right? A high point everyone was discussing was the aluminum ladder that was in the middle of the highway. 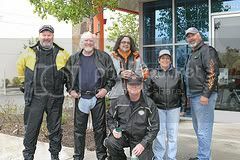 We all managed to avoid a direct collision, but some of the biker admitted having clipped it. I haven't taking a an advanced course in riding where the students are shown how to ride over pipes and bricks. Apparently, trying that technique with assert is risky since the object isn't a solid piece of matter that would stay stationary under a motorcycle wheel. Rather, once the front wheel treads over the left side of a ladder, the difficult part would be clearing the other side; and this while the ladder moves around under the weight of the tire on the left side. Other than that, good times. I love the Art Deco diner !